Bio Glow medium grade 0.2 mm used for slightly more robust baits. 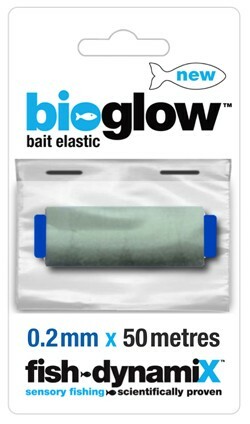 Bio Glow is a new concept in bait elastic that we have developed through studies and scientific research. Bio Glow has unique and secret formulated material that mimics natural looking patterns and light of Bioluminescence. Bio Glow glows once charged by normal sunlight or by a standard torch. It emits a yellow green glow and is used to mirror what the fish see naturally, which will then attract the fish towards your bait. We want Bio Glow bait elastic to be seen and glow. Bio Glow is loaded on 50 metre handy spools. FREE Delivery on all Fish Dynamix Disgorger / Baiting Needles / Elastic over £100!! !